Surprise!! I'm having a fabric panel giveaway!! I've decided to hold a giveaway each month in 2014 and realised I'd better get onto January quickly before it slipped away. SO, all you lovely folk need to do is leave me a comment here in this ol' blog, Yep, old school, style. No extra sharing or reposting or liking needed (although, if you want to like my Facebook page, I wouldn't object. I post there way more than here!) and if you want to share or repost, I certainly will be thrilled). I'm thinking of doing a bit of advertising this year, the odd banner ad here or there, so I'd really love to hear your suggestions of blogs or websites or magazine or what-have-you that you think would be a good fit for my work. If you can think of one, pop a link in the comment and I'd be extra grateful but if you can't think of one, don't stress, just leave some nice words and you're still entered. I'll draw a winner on January, 28th and that lucky person will be able to choose four handprinted fabric panels from my shop, delivered anywhere in the world. 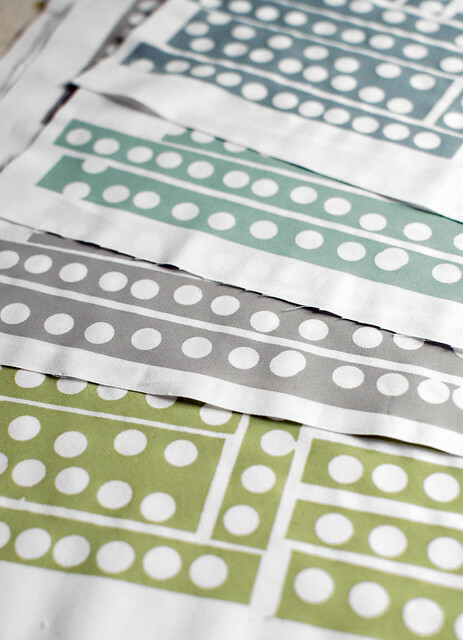 You can check out the goods on offer right here: Maze & Vale fabric panels. I would love to win some of your beautiful panels! Thank you for the opportunity. Hi im Aisha from Indonesia! i loved your beautiful handprinted fabrics and mind to learn how stamp on fabric. and your fabric design too. you know, i love the pattern and color pallete. i hoped get lucky to get your 'treasures" :D thankyou! This is incredibly generous of you! Thank you! I would be very happy to win your beautiful fabric! My sister is having her first baby any moment now and I would love to make her a baby quilt. 4 panels might just do it?! No idea about advertising not my forte! How amazingly generous of you. Would love to win. thank you! Greetings from Wolfsburg, Germany! And thank you very much for this generous giveaway. Your choice of colour and patterns reminds me of Lotta Jansdotters prints, which I also like very much. Oh, that would be a really nice surprise. I must admit -I live in Europe, might be a bit expensive to send - but I'll try anyway. When I took part in the 3. fabric swap one lady in the group didn't send her share of fabric. Maybe it was too expensive - although she is from US. BUT: I'll certainly would be delighted to win! I love your work and would be thrilled if I would win! I just recently got acquainted with your work and absolutely live the fabric. I love your prints!!!! Thanks for this great give away oppertunity. What a great Giveaway Leslie. After just receiving some of your gorgeous fabrics in the post I would love to get my hands on some more - can never have too many Maze and Vale prints in the collection i say!!! I love your designs and color palette! Love your fabrics!! They would look good in a quilt in Norway! I love your fabrics and have been following your work on Fb for some time. This is generous of you. thanks. I make hand dyed fabric. Cape Cod Shibori. Wow, would love panels of your fabric! What a generous giveaway - I thought of three online magazines that could interest you, Covet Garden, Heart Home, and Sweet Paul (this also has a print version).Thank you! Love those colors! As for banner ads...well. Made (Dana made it), Sew Mama Sew are ones that come to mind. What a fun surprise! I would love to win. I love your tiny forest mushrooms. They are wonderful. having some new fabric might be just what i need to get back into the swing of things. Wow, what a wonderful giveaway! No marketing suggestions, but I love your work. I would love to win these - the new designs are gorgeous! What about advertising from small homewares shops? We have a cluster of cool places (ecohaven, funky homes and one other new one whose name escapes me!) down here in Hobart who I could definitely see selling panels as is or stuff like cushions made from them, and might want to advertise in return. You are just about local, plus organic so it might fit - there must be similar places in Melbs? I don't know any of those shop owners so that's just a random idea! Great give away. I could put your lovely fabrics to good use. Love that gray dot panel!! I would love to build a quilt around that design! Thanks for the chance to win! Beautiful work. Looking forward to attending your workshop next week! Pips. Great giveaway! Your work is gorgeous. Lovely new prints. Thanks for the giveaway. Your fabric is so gorgeous. Thanks for the chance to win! Fingers crossed! I love your work! I absolutely love the colors you use and would love to add your fabric to my stash! as always i will happy stack your fabric on my shelf any day. have you thought about doing a little sponsoring for the kids clothes week challenges as they are quartery now. would be great as you have participated yourself and i would think a lot of people who sew for the kids also take up the odd quilt, bag or cushion. wow, I would love to add some more of your beautiful fabrics to my collection. Love them as always! Beautiful fabrics and a very generous giveaway. I read a lot of other quilting blogs and think that would be a good place to spend some money on advertising. In Color Order is a blog that has a great following, just off the top of my head! Thanks for sharing your new creations, designs and colors! I love your prints. They are so beautiful. I am working on my first baby quilt and would be so happy to win. I'm from Germany and found you through tagfuertag. Love your fabrics. I particularly enjoyed reading about your design process for your tribute and bokah designs. Very interesting! Thanks for sharing. Wow, what beautiful fabric! Thank you for the giveaway. Love the vibe of your fabrics, there's something very earthy about them. Would love the chance to have some in my stash. I can't think of any sponsors off-hand but like the idea of offering sidebar space to small local independent designers. Reading blogs like yours is often how I stumble across other talented artisans. Oooh this is a giveaway I would love to win! Yay for monthly giveaways! I'd love to advertise your shop on my blog---it fits so nicely with the hand-printed fabrics I sell. Let me know if you have any interest! Thanks for the opportunity to win some of your gorgeous fabric! I have been eyeing your fabric for a while now! Thanks for the chance. i just got some of your sample packs which are awesome. I would love some more of your gorgeous fabric!! I love your blog! I haven't participated in the handmade fabric swap yet, but I hope to be able to one of these times! I love your colour palet and the cleanness of the prints. So beautiful! Thanks for the opportunity to enter the comp! gorgeous panels - thank you for such an opportunity. I am not sure on advertising locations though. Like many I don't subscribe to mags a lot and d find makers like you through posts on blogs or instagram - so word of mouth really. Although Mollie Makes have had some great Australian businesses included in their pages. Have you managed to get a post on the Design Files? Hi Leslie, thanks so much for the chance to win some of your gorgeous fabric! I was just checking out your website and see you have added a range of cushions and quilts since I last visited. Beautiful! I can recommend www.redparka.blogspot.com and www.kittyandbuck.com as affordable, very supportive places to advertise - both are illustration/design-based blogs (Australia-based) so their audiences should fit your market too. Hi, your fabric is lovely, and I really enjoy your blog. I'm in Canada, and used to live in Australia too. Thanks for this opportunity - I've just been admiring your new designs!! Love all the fabric! The style , the colours, everything... Would love to make a quilt with some! Have you considered Bespoke magazine, or Tickle the Imagination for advertising? I love your colors, values and crisp designs. I'd love to take a workshop with you, however--alas--I live in New Mexico. The panels are gorgeous. I'd be so honored to win. For advertising I would check out Mollie Makes or their sister publication The Simple Things (http://www.thesimplethings.com/) - The Simple Things may be better for your kits. Also check out http://generationqmagazine.com/. Thanks for the giveaway! Beautiful fabric!! Thanks for the giveaway!! I'd look at the fabric blogs on bloglovin with the most followers and see which take sponsors. Quite a few do now.